Westmead Multiplex Connectivity Centre manager Jo Osborne, Westmead Redevelopment arts and culture co-ordinator Marily Cintra and Westmead Redevelopment director of transformation and redesign Carla Edwards. Health and Arts Research Centre Inc (HARC), who are co-ordinating the Westmead Redevelopment’s arts and culture program, recently secured a $50,000 grant from Create NSW to extend the work of the ArtsLab@Westmead – a new artists’ space at Multiplex’s Westmead Connectivity Centre, near the site of Westmead’s new hospital building. The ArtsLab is an experimental space for local artists, curators and cultural workers to build capacity for health arts projects at Westmead. 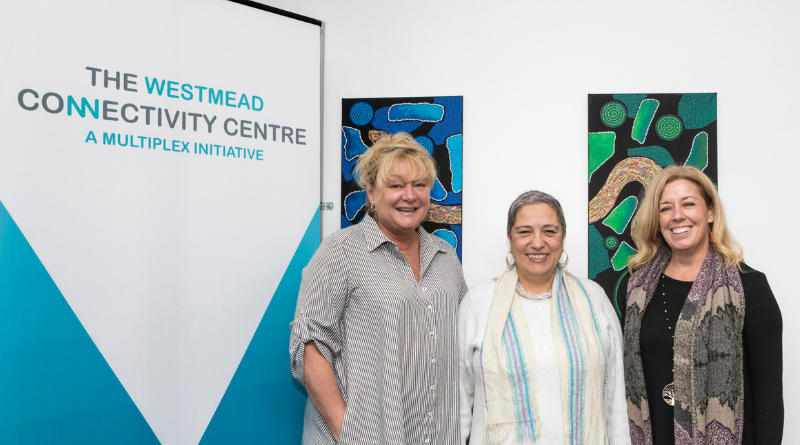 Westmead Redevelopment arts and culture co-ordinator Marily Cintra said the grant would fund 10 artist residences, focused on creating works for Westmead Hospital, the precinct and local communities. One of the first projects will be the development of a sensory wall for Westmead Hospital’s new aged care behavioural management unit. “The ArtsLab is a fantastic opportunity for us to build the capacity of our local artists and provide the opportunity for them to create exciting, innovative works for the hospital,” Marily said. “Art in health is a growing field, with few opportunities for training and experimentation; Westmead provides an excellent convergence of healthcare, research and education for artists to explore. “We hope to have different art forms inspiring a future, ongoing arts program at Westmead. Multiplex Connectivity Centre manager Jo Osborne said the ArtsLab was a great collaboration between local artists and businesses. “The ArtsLab will be a creative hub for artists, offering them studio space for new works,” she said. The Westmead Redevelopment recently launched its arts and culture strategy, aimed at transforming experiences at Westmead through the arts across healthcare, education, training and research. The strategy – a partnership between Western Sydney Local Health District, the Children’s Hospital at Westmead and the University of Sydney – is designed to embed arts and culture into the fabric of the Westmead precinct, including its new hospital building and refurbished spaces. Fourteen projects have been endorsed for the new facility, with exciting artwork set to adorn new clinical spaces, waiting areas, the new plaza forecourt and the Innovation Centre. To get involved in the ArtsLab@Westmead, contact Marily at marily.cintra@health.nsw.gov.au. The Westmead Connectivity Centre, a Multiplex initiative, is a hub for collaboration and support, matching job seekers with providers, and creating genuine opportunities for the western Sydney community. Find out more about the Arts and Culture Strategy at the Westmead Redevelopment’s website.